This week, Europe will be coming out of the UK Referendum shock enter into a process of managing it. The IARS International Institute and its “Abused No More” partnership find this to be the right timing to release its youth-led pan-European investigation into what matters for young people in Europe when it comes to their rights. The results are today released in the form of a free e-book titled “My Voice – My Rights: Young, Marginalised and Empowered by Law”. The research was conducted with young people by young people in the UK, Poland, Italy, and Romania and reveals that lack of knowledge of basic rights leads to a vicious circle of further marginalisation and exclusion. Increasing legal literacy of marginalised youth through the provision of public legal education (PLE) constitutes a key empowerment tool that can facilitate integration and promote inclusion. However, there is a substantial gap in education and training services across Europe to provide young people with basic legal skills and knowledge that will enable them to address and assert their rights when facing discrimination and abuse. Dr Howard Williamson, CVO CBE, Professor of European Youth Policy, University of South Wales said: ‘My Voice – My Rights’ resonates powerfully with the 2nd European Youth Work Declaration. As inequality in Europe worsens and the migration ‘crisis’ deepens, we need more creativity and initiative in supporting those young people who are most adversely affected by it. 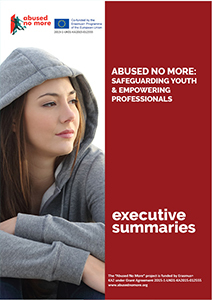 This e-book is but the first to emerge from the Abuse no More strategic partnership supported by the EU Erasmus + programme. It holds much promise. It is an exciting project at exactly the right time. 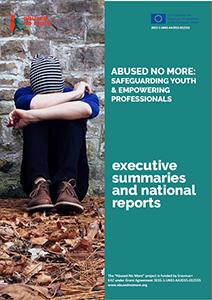 The e-book can be downloaded for free here and was produced in the framework of the 3-year “Abused No More” Empowering Youth and Safeguarding Professionals” (AnM) programme. “AnM”, co-funded by Erasmus+, is the first youth –led initiative in Europe that addresses the lack of legal literacy of marginalised youth at risk of social exclusion with particular focus on those young people that face multiple and intersectional discrimination based on age, gender and ethnicity. Furthermore, the project utilising youth-led methodologies addresses gaps in education and training provision for young people marginalised people in relation to anti-discrimination. Faisal Kassim, Chair of the Youth Advisory Board Since last year, approximately 1.1 million refugees entered Europe from Syria, Afghanistan and Iraq. Most of them reported to be women that usually have no legal awareness. Their lack of legal knowledge makes them more vulnerable to abuse and discrimination. That is why this e-book and Abused no More programme could not have come at a better time. What makes this book unique, however, is the fact that marginalised youth were given the opportunity to take leading role in designing and implementing future training programmes. · The project is delivered in partnership with Stowarzyszenie Interwencji Prawnej (Poland), KISA – Action for Equality, Support, Antiracism (Cyprus), Anziani e Non Solo (Italy) and Romanian U.S. Alumni Association (Romania). The IARS International Institute is the coordinator for the programme.